Do you sleep on your side? Did you know that there are mattresses that are better than others for side sleeping? You might be sleeping on the wrong mattress for your preferred sleeping position. The Better Sleep Council suggests that 41 percent of people sleep in a fetal side position with their knees slightly raised. This side sleeping position is not only popular but the most “sound” way to sleep. But when you sleep on your side, you might be putting extra stress on your hips, shoulders, ribs and neck if you are on the wrong mattress. Not every mattress is made for side sleeping. A mattress that is too soft will cause your hips to sink in to deeply when you sleep on your side and may cause back pain. Conversely, a mattress that is too hard can cause unwanted pressure on your hips and can lead to sciatic nerve pain. The best mattress for side sleepers supports the hips and shoulders while allowing enough give to alleviate any pressure points, and keeps your spine aligned. 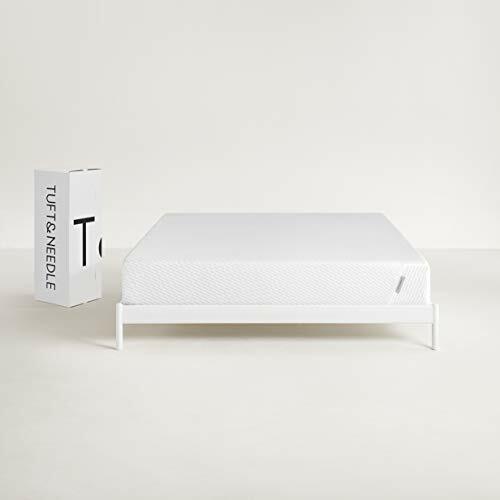 Hands down, one of the overall top rated mattresses, the Tuft & Needle Mattress is satisfying a ton of side sleepers who love this bed for its firm but comfortable feel and for its versatility as it supports people of all body types. You want a firm mattress: This mattress has a high density base layer of foam and a second top layer of high density foam that makes this mattress sit on the firm side of the mattress scale. If you want the feeling of foam but not the sinking feeling of memory foam, this might be the mattress for you. Thousands of customers are reporting that it is in fact adaptive and has enough give to be supportive for your body, with no mattress sag. You are on a budget: This mattress is great value for the materials and the number of positive reviews. For a high-density foam mattress with a great return policy, the price is well below competitive mattresses. You sleep hot: Because this is a firm foam mattress, this bed offers more of a floating on top feeling than memory foam beds. Some people who sleep hot find that memory foam makes them hotter, because they sink into the bed too much. With this bed, customers report that they rest above the mattress more and the bed is made with breathable materials. You have a sleep partner: The adaptive top layer of foam means that this mattress conforms to the individual body type, weight and preference of each person who sleeps on it. The high level of density in the base layer of foam means that this mattress doesn’t move a lot when your partner turns or gets into bed. If you are a light sleeper, this mattress may be a good choice for you. The Tuft & Needle has pretty basic construction compared to other mattresses and is made with only two layers of foam. A high density patented adaptive foam top layer is what is making a ton of customers say that this mattress responds well to their body and provides firmness but no pressure on their shoulders or hips. Because it’s designed to be adaptive, and reviews are showing that this is true, this works well for couples who have different needs. Below this adaptive foam is a second layer of high density foam, or the “support layer” that serves as the bed foundation. This support layer is designed to prevent you from sinking in too deeply which can cause curvature of the back and sinking of the hips for side sleepers. People with back pain who like a firmer feel than their partner are finding this mattress has just the right level of push back because of the dense base layer but there is a bit of softness in the top layer, which prevents pain on pressure points. Because of the density of this base layer, reviews also suggest that this mattress is good for light sleepers who are easily woken up by the movement of their partner. And although some customers, particularly those who are moving from an innerspring mattress, find this foam mattress too hot for them, overwhelmingly, customers like that they don’t sink in too much with this mattress and so they sleep cool. Not only do you not sink into this mattress too much, which helps with coolness, the mattress is made with some cooling materials, such as heat wicking graphite and gel infused foam. As well, the mattress has a breathable fabric cover. Because this mattress is not made entirely of eco materials, some customers have reported an off-gassing smell that disappears within a few days. The mattress arrives compressed and vacuum sealed, so once it is opened and it has time to expand, the smell typically disappears after a while. The polyurethane foam is made in the US and CertiPUR-US certified for indoor emissions and toxicity. That being said, if you are particularly sensitive and have allergies you might want to consider a different mattress as some customers who are allergic to synthetic foam have reported a reaction to this mattress. We love the great return policy of this mattress that differs depending on which site you purchase it on. They have a long sleep trial period of 100 days and a great warranty as well of 10 years against manufacturing defects. Priced incredibly low for mattress of a similar type, we like the low level of risk of this mattress. Thousands of positive reviews, a chance to test it out for 100 days to see if it works for you and the possibility of returning if it doesn’t. What more can you ask for? If you want a supportive mattress for sleeping on your side, but you aren’t a fan of firm mattresses, the Leesa mattress might be the choice for you. Unlike some of the top choices on our list, the Leesa mattress has a layer of memory foam and is a bit softer than some of the other foam beds. You like a bit of memory foam: While not an overly thick layer of memory foam, the Leesa bed does provide a two-inch layer of memory foam inside the bed, so if you find that most foam beds are too hard for you or if you have particular hip problems that demand a softer bed, the Leesa bed might be a good choice. You are on a budget: While not as competitively priced as the Tuft & Needle mattress, the Leesa mattress is still priced quite a bit lower than competitive mattresses, particularly since this mattress has three diverse layers and is made at such a high quality and is durable. You want a long trial period: It’s nice to have the option to try a bed out for 100 days and make sure it’s something you can live with, for the long term. The Leesa mattress company only asks that you try the bed for 30 days before making a decision and then they will pick up the bed if it’s not for you. You share the bed: This bed has relatively low motion transfer, especially compared to an innerspring mattress. The density of the base layer of the bed means that it doesn’t shake or move too much when your partner moves around. If you are a light sleeper, this bed might work for you. Rated by some as a 5 or 6 on a firmness scale of 10, the Leesa mattress has a memory foam layer to give you a bit more of that sinking in feeling that some people love. The Leesa mattress is made from three layers of foam and has no innerspring core. Because of this, like the Tuft & Needle mattress, this bed is a great choice for couples who are easily woken. The six-inch-high density foam base layer of this bed means that it doesn’t move around too much when you or your partner turns or gets in and out of the bed. Above this layer is a two-inch layer of memory foam. This helps to give the mattress a bit of a softer feel than our top Tuft & Needle pick, so if you like a softer bed, this might be the best pick for you. The top layer of the mattress is a two-inch layer of polyurethane foam called Avena foam. Avena foam is a patented type of synthetic foam that is intended to be contouring but more durable and breathable than latex. The cover is designed with breathability in mind and is made of a polyester Lycra blended material so it is a bit stretchy to move with the compression of the foam and is seamless so there is no annoying stitching, pillows or buttons. Side sleepers who have problems with their hips such as sciatica are happy with this mattress as the memory foam layer provides a bit of a soft touch while the base layer of foam provides stability. People on the heavier side might want to check out firmer mattresses link the Winkbeds hybrid which offers a bit more support. People who sleep hot do not seem to have a problem with the level of “sink” in this mattress and despite the fact that it’s not overly firm, most people don’t find this mattress too soft. Some customers have mentioned that because it is a bit softer, the edge of the mattress isn’t as supportive as they would like. So, if you like to sleep on the very edge of the bed, this is something to keep in mind. However, for couples, this mattress provides enough edge support that the two people won’t roll into the middle and reviews suggest the bed doesn’t sag over time. At a relatively lightweight 69 pounds, this bed is easier to move than other mattresses, particularly compared to heavier innerspring beds. However, this mattress has no handles and that has made it challenging for some people. We love the philanthropic, “giving back” mission of this company. For every ten mattresses that they sell, they donate one to someone in need and their website features an impressive number of stories, with photos of mattresses donated to various shelters across the country. They have given away over 10,000 mattresses to date. They have also partnered with the Arbor Day Foundation and they plant one tree for every mattress sold. They also donate time and resources to charitable organizations and even offer a ten percent discount for those with military ID. Because this mattress is not made of all natural materials, and arrives compressed, some users have reported a smell when they open the bed, that dissipates after a few days. This bed isn’t the best choice for someone who has environmental sensitivities or allergies to polyurethane, although the foams are all CertiPUR-US certified and the top layer of Avena foam is hypoallergenic. Like the Tuft & Needle bed, the Leesa mattress has a 100-night trial available for customers to make sure it is what they are looking for. They just ask that you try it for at least 30 days. As well, the company has a decent warranty on the bed, and offers full replacement for 10 years on manufacturing defects. 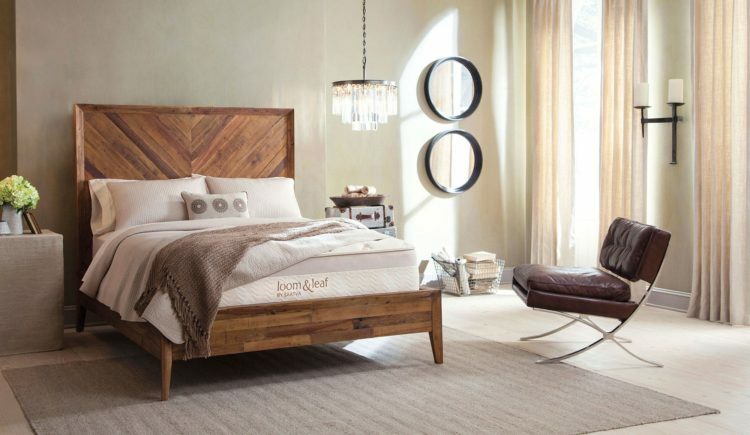 While not made with 100 percent all natural materials, the Loom & Leaf bed is about as close as you can get without completely breaking the bank. This bed is consistently one of the highest rated beds of this quality and its durable, luxury style construction has made for plenty a satisfied customer. You want a longer sleep trial: Most mattress offer a maximum 100 day sleep trial. Loom & Leaf goes a cut above this and offers four months of trying this mattress before you have to fully commit. We think this is great because sometimes it takes longer to really know if you love the bed or not. Four months should let you know for sure if you like this bed, and this may even let you try it across two seasons to see what it’s like in various temperatures. You want some natural plant based materials: As we mentioned above, very few mattresses are made with 100 percent plant based materials and if they are they are very expensive. Loom & Leaf keeps their price competitive, while offering some plant infused foams and a fully organic cotton cover. Not perfect, but better than some. You sleep hot: The top layer of gel coating in this mattress has been getting rave reviews by customers who get too hot when they sleep. Particularly for customers who have been avoiding memory foam because they are worried about the hot feel, the upper layer of cooling gel has been a boon for sweaty sleepers. If you are usually chilly at night, this might not be the best option for you, but hot sleepers are overall satisfied. While some foam based mattresses are just one or two layers of foam, the Saatva Loom & Leaf Memory Foam mattress has a variety of different types of foam layers to give it a luxury level of construction and great value for the price. A high loft bed, this mattress sits at 12 inches and includes lower dual layer of plant based support foam that is meant to be breathable and provides a firm foundation for the layers that rest above it. Above these two layers is a five-pound layer of premium memory foam that also has some plant based components. It’s this layer that gives the mattress its softer feeling and most users report that the “relaxed firm” option of the mattress is about a five on a ten-point firmness scale with ten being the firmest. The top layer is made of their proprietary “Spinal Zone Gel” and is basically just a cooling gel layer and a great option for those who sleep hot. This is a particularly good feature for those who prefer the softness of memory foam but tend to get hot with beds that they sink into. The whole mattress is covered with an organic cotton quilted cover that has a flame retardant made of natural thistle rather than a chemical spray. This cover is of high quality and is a nice 5/8 of an inch thick, so it feels durable. Customers report that this mattress is great for side sleepers, particularly those who have problems with pressure points caused by excess weight or back problems. What’s more, the Loom & Leaf mattress comes in two comfort levels for firmness and we recommend the “relaxed firm” option over the “firm” option for customers who are side sleepers. While this bed doesn’t cause you to sink in excessively, there is some give there that cushions the body and it is good for people who have problems with firm or innerspring mattresses or for people with hip or shoulder problems. Despite the fact that this mattress does have a fair amount of memory foam, it also is pretty breathable for most people. Going by customer feedback, the cooling gel layer seems to be a good option for hot sleepers and the organic cotton top makes for a cover that is both moisture wicking and quick drying. Reviews for this mattress suggest that there are very few other mattresses that offer this level of construction for this price, particularly with regards to the efficacy of the cooling top layer. This is something to consider if you are particularly on the hunt for a gel top. Loom & Leaf also offers a warranty a cut above its competitors at 15 years. Their home trial period is longer too, at 120 days as opposed to the 100 days that most of the competition is offering. If you are on the hunt for a bed that is made with memory foam and has at least some plant based materials, the Loom & Leaf mattress is probably the best option for the price. Speaking of hot sleepers, the Loom & Leaf mattress isn’t the only option out there. Many customers are also happy with the Layla Sleep mattress for its copper infused memory foam and design that is promotes air flow. You like the idea of a copper infused mattress: While we couldn’t find any conclusive proof that the copper infused foam in this bed has medical benefits, it can’t hurt if you have arthritis or joint issues and some people do swear by the healing benefits of copper. For the price, this is a lot cheaper than most copper infused mattress toppers and if you like the idea of copper in your bed, consider it a bonus with this mattress. You want an affordable memory foam bed: For the price, this mattress provides great value. A lifetime warranty and a long sleep trial period, this mattress is a great buy for a memory foam bed, especially since it has two sides. You sleep hot: This mattress might be a great option for you if you sleep hot and you like the cushion of memory foam but you are worried about it retaining too much heat. Apart from the egg carton foam as the foundation of this bed, the gel mattress cover helps to keep this bed cool and it has great reviews from hot sleepers. Layla touts itself as the first copper infused memory foam bed but the jury is out as to how beneficial or effective the copper actually is, from a medical perspective. That being said, it certainly can’t hurt to have copper as an additive to your foam mattress, especially if you suffer from conditions such as arthritis or joint pain that can make side sleeping painful. More than the copper infusion, customers seem to be more impressed with the fact that the mattress is dual sided, so they feel like they get two mattresses in one. The Layla mattress has a convoluted, or egg carton shaped foam interior with the two copper-infused memory foam layers on either side. The firmer side has a one inch layer and the softer side, a three-inch layer, so you can choose how much sinking in you want in your bed. This is a handy feature for side sleepers, because while some feel that a firmer feel helps to keep their spine aligned and is best for their hips and shoulders, other side sleepers prefer a softer memory foam bed, especially if they have problems with sciatica, pressure points or they are overweight. This mattress may also be a great choice for hot sleepers. Not only does it have the benefit of a firm memory foam side, meaning hot sleepers won’t sink into a bed that hugs them and makes them hotter, it also has a nice thermos-gel infused cover, designed to keep people cool at night. On top of this, the convoluted, egg carton shape of the foam inner layer is designed to promote airflow rather than retaining heat inside the foam. Another great feature about this mattress is it blows all other warranties out of the water. Layla offers a lifetime warranty, and you can’t really beat that. They also offer a lengthy 120-night trial. While they don’t use natural materials in the mattress, apart from the copper, they do use high quality foam and fabric. Their foam is all poured and assembled in the US and it is CertiPUR-US certified. Some customers have mentioned an off-gassing smell from the foam that dissipates after a few days and, at this price, this is a highly competitive memory foam mattress. A memory foam bed doesn’t have to break the bank but the prices with these kinds of beds ranges vastly and it can be a headache to try to figure out why some are cheaper than others and if there is any value to the more affordable options.Sleep Innovations is one company that is delivering a high-quality mattress for a price that is hard to believe, but thousands of happy customers can’t be wrong. You want to pay as little as possible: For a multi layered memory foam mattress of this quality, you really can’t beat the price of this mattress. For a mattress this affordable, one would expect reviews that are on the middling or mediocre side, but customers are overwhelmingly happy with this mattress and we think that makes this mattress a great pick. You want a memory foam mattress: This mattress is a good choice for those who want a supportive mattress with a thick foundation layer, but want the cushioning sink of memory foam. While not as cushy as the soft side of the Layla mattress, this mattress sits on the “medium-soft” end of Sleep Innovations scale and great for people with arthritis, hip or rib problems. You want a mattress specifically for side sleepers: Many mattresses have one mattress on offer and it is made with the attempt to accommodate all body and sleep types. With the Sleep Innovations Alden mattress, you are getting a mattress that is specifically for side sleepers and designed to support them, specifically. Sleep Innovations makes more than one type of mattress so if you want to buy a bed that is customized to how you sleep rather than a bed from a company who just makes a one-size-fits-all bed, this might be the mattress for you. Their Alden mattress has a medium-soft feel and their mattresses range from medium-soft to medium firm, which puts the Alden on the soft end of their mattress scale. The mattress has a fairly thick piece of support foam as its bottom layer, at nine inches. This means that motion transfer is pretty minimal. Above this is what they call their “Breezy Middle Layer” and is a two-and-a-half-inch layer of air channel foam. This works to make the mattress more breathable, despite its softness. The top layer is a two-and-a-half-inch layer of memory foam, so while this is fairly thick, it’s not as thick as the soft side of the Layla mattress. And, although it’s on the softer end of the Sleep Innovations softness scale, reviews are saying it’s fairly firm for memory foam but nice and cushy on the hips. So, the “TriComfort Design” as they call it, does deliver for customers that are side sleepers. This mattress has no gel layer on the top but their memory foam has cooling gel beads infused into it is made of a proprietary open cell type of foam, to promote airflow. Customers are overwhelmingly happy with how cool this bed sleeps, even in the summer. Some are throwing on flannel sheets or a warmer blanket, in the winter, but in the summer, this bed is delivering and it sleeps cool for most. Side sleeping customers are overwhelmingly pleased with the support that this mattress gives and the majority of people feel that this mattress is firm enough to keep their spine aligned, while providing the nice cushion of memory foam. One customer with a rib injury, who previously had a lot of pain sleeping on their side, raves about the comfort of this mattress and now he can sleep pain-free. Other customers with arthritis and osteoporosis are equally pleased with this bed. The mattress has a cotton polyester cover, so there is a small amount of natural materials in this bed, but nothing to write home about. That being said, customers are reporting very little off gassing smell here and the foam is CertiPUR-US certified with no formaldehyde or other toxins. 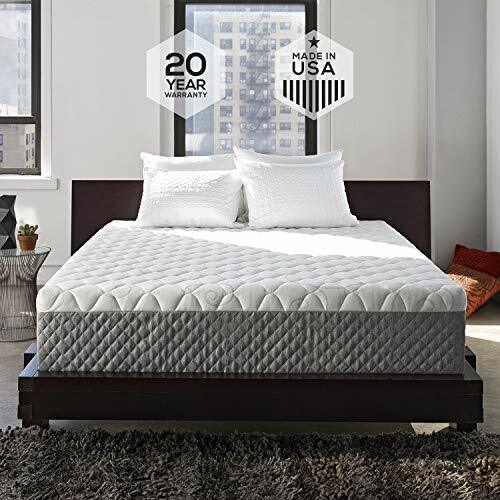 We love the price of this mattress and for a multi layered memory foam bed, this mattress falls way below similar mattresses and yet it has great reviews, overall. It has a nice 20-year warranty and while we couldn’t find anything about a sleep trial period, we still think this mattress is great value and one of the lowest priced but highly rated memory foam mattresses we could find. Based on our deep dive into the world of mattresses for side sleepers, we’ve determined that the the Tuft & Needle mattress is the best option for side sleepers . We love it’s firm but supportive feel, the high-quality materials that it is made with and the value for the price. They offer a great warranty and sleep trial and we like the basic construction of this mattress. It’s plain and simple and does what it says it will do and the thousands of happy customers and positive reviews show that a good mattress doesn’t need to have complicated layers and materials. Finally, while some customers report some off gassing, the Tuft & Needle is made of high quality foam and is certified against toxic emissions. Overall, a great pick for side sleepers and adaptive in case you have a sleep partner who sleeps on their back or stomach. Supportive Core: The best mattress for side sleepers is going to be one that has a strong, supportive core so that it can provide stability for your back without sagging under the weight of your body. A mattress that has a core that allows you to sink in too deeply is going to make for a curved spine and aches and pains by morning. Comfortable top: If you sleep on your side, you need a firm mattress with a supportive core, but the top layer of the mattress should have some give. Memory or regular foam is a great addition to a mattress for side sleepers as it provides support while taking weight off the pressure points on the side of your body. Breathable: Because side sleepers often sleep in the fetal position, with their knees up, they can also be too warm at night. This is different than stomach or back sleepers who sometimes splay out and, so, disperse their body heat. A quality mattress made with breathable materials will help side sleepers stay asleep, instead of waking up from sweating. Natural or Certified Safe Materials: Regardless of what position you sleep in, you should be concerned about what your mattress is made of. Since a good part of your life is spent sleeping, consider the toxicity level of your mattress and look for natural materials or foam that is certified safe by reputable organizations. Warranty: As with any mattress, a good warranty makes for peace of mind when purchasing. Apart from covering manufacturing defects, a good company will offer a “sleep trial” to allow for returns if you aren’t satisfied after sleeping on the mattress for a certain number of days.